Large format (>100 mm diameter), narrow bandpass filters (NBPF) are required in many fields. Applications requiring a large field of view drive the need for large collection optics, however high wavelength selectivity provided by narrow, flat-top bandpass optical filtering is also required to facilitate specific and selective analysis of a phenomena or substance of interest. The diversity of applications of these optics include earth observation remote sensing (whether satellite imaging or UAV mounted LIDAR), astronomical/solar imaging, UV micro-lithography tools, and live animal biological (fluorescence) imaging. Different applications can have different demands on an optical filter’s wavelength selectivity – the characteristic of the filter defined by range and level of wavelengths transmitted by the filter (the passband) and the range and level of wavelengths rejected by the filter (the blocking band) – in order to optimize the signal to noise ratio at the detector of a system. Filters need to be designed and manufactured to achieve the desired wavelength selectivity over the entire clear aperture (CA) of the optic and over the entire range of operating parameters including angle of incidence (AOI) and cone angle, and environmental conditions of use. In multi-layer, dielectric, thin-film filters, variations in angles of incidence and operating temperature can produce a shift in center wavelength (CWL) – increasing AOI causes the filter profile to shift to shorter wavelengths; increasing operating temperature typically causes a shift in the filter profile to longer wavelengths. These wavelength shifts need to be accounted for in the filter design and manufacturing processes and contribute to an increased requirement for steep transitions from passbands to blocking bands. Each of these requirements for additional design “margin” can make the successful manufacture of large NBPF a particular challenge. To achieve this both superior precision (uniformity and control of filter shape) and superior accuracy (control of center wavelength positioning) are required. Additionally, many applications, particularly those in remote environments (e.g. deployed in satellite instrumentation), require that the filters maintain their spectral performance characteristics over many years. This requires a very robust filter design and manufacturing strategy along with careful selection and treatment of materials used in production. Iridian has addressed each of these challenges and has recently demonstrated the successful design and manufacture of an environmentally stable 1.72 nm-wide (FWHM) NBPF centered near 780 nm to within 20 pm of the target over an operating clear aperture >125 mm in diameter. 2 How Much Better is this? 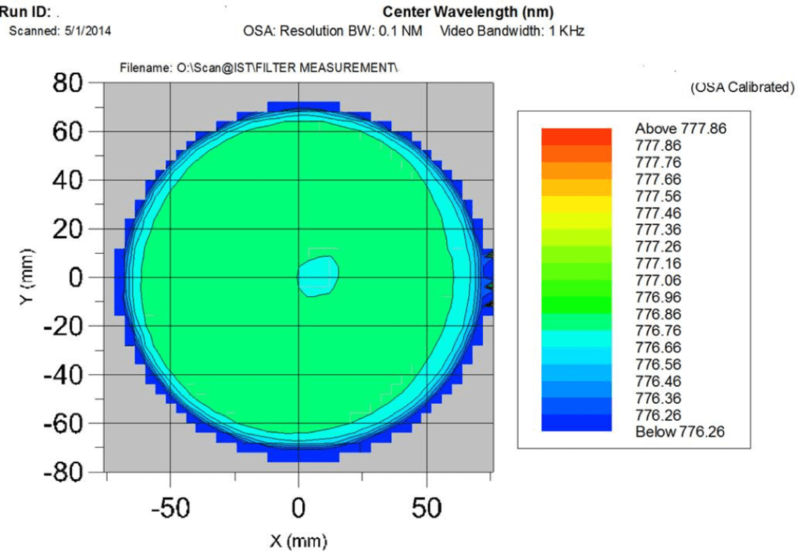 Excellent uniformity control of spectral performance is desirable in all applications of optical filter manufacturing as it increases the coated area that meets specifications. In the case of small format filters, such as ½” to 1” spectroscopy filters or very small (~1.5 x 1.5 mm2) filters for fiber-optic telecommunications systems, a broad spectral uniformity can help increase the number of parts yielded from a coating run and therefore reduce the cost per filter. In the case of very large optics (>100 mm in diameter) the requirement for highly uniform coatings becomes critical to the functionality that can be achieved as uniformity governs the size of clear aperture and/or degree of wavelength selectivity that can be delivered. Typical high-end commercial filters demonstrate a uniformity over >100 mm of ~0.1-0.2% of the center wavelength. The filter described here is coated to within a uniformity of <0.02% of the center wavelength over a clear aperture diameter of >125 mm – nearly an order of magnitude improvement in uniformity over the existing high-end benchmark. With any very narrow band filter uniformity and filter shape are not sufficient to ensure excellent functional performance. 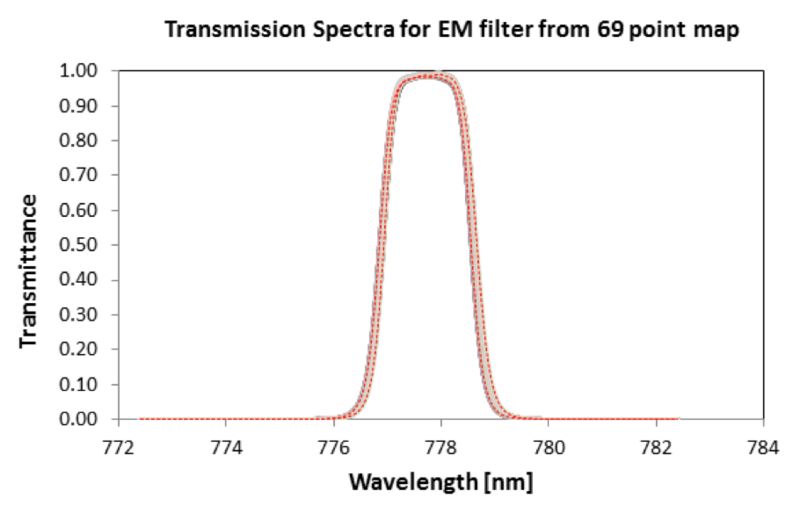 Offset in center wavelength targeting can result in loss of signal if the peak of the NBPF is not aligned with the spectral line of interest- be it a laser wavelength or absorption peak of an analyte of interest. Typical optical filter manufacturing can target small (<1”) filters to within ±100 pm of the target CWL. The large NBPF created in this work was manufactured to match the target CWL to within ±10 pm (averaged over the clear aperture). Having achieved a remarkable performance level is of no use if the filter cannot survive processing or if it degrades in operational environmental use conditions. The coating process (energetic magnetron sputtering) and materials used inherently produce robust and reliable coatings. However, in pushing the deposition conditions and annealing processes we were unsure that we would achieve our typical reliability and durability for this filter. Nonetheless, the filter successfully passed a series of prescribed environmental durability tests such as mild abrasion (50 strokes cheesecloth at 5N force), solubility (acetone and ethanol dip for 5 minutes), humidity (55 °C and 95% RH for 48 hours), multiple adhesion (rapid tape removal), and thermal vacuum cycling (30 cycles between ±90 °C with 30 min dwell time at each extreme). Additionally, the filter survived without change post-coating sizing (coring) which is a very harsh test for adhesion and filter robustness (it will never experience any similar abuse in use). Lifetime stability (minimization of change in performance over time and temperature) was also a critical parameter for this filter. Thermal aging testing (damp heat) models indicates that this filter would shift by <10 pm in CWL if used at 85 °C for 10 years. Additionally, the stability in performance between use in air and in vacuum was tested as other technologies such as evaporative coating can exhibit shifts between air and vacuum. No measurable change in CWL between air and vacuum was detected to within the measurement accuracy of the test instruments (±20 pm). To produce filters with a steep, narrow bandpass at a fixed center wavelength over a large clear aperture the deposited film quality has to be homogenous across the surface and have low scatter/haze to maximize signal to noise. Additionally, uniformity stability is needed throughout the coating run to maintain the desired filter shape. To produce filters with these characteristics careful consideration was necessary with respect to coating target and substrate positions and relative motions, gas flow distribution, in situ temperature control, real-time in situ single wavelength monitoring (SWM), and stability of the coating process. To achieve the CWL accuracy of within ±10pm of the target CWL it was necessary to develop a thermal annealing setup that would ensure uniform annealing over the entire surface of this large, thick filter (large thermal mass). Since this filter design shifts to longer wavelengths with annealing it was necessary to deliberately target a shorter CWL out of the coater to allow for the CWL of the filter to be iteratively pushed to slightly longer wavelengths with each anneal cycle. Additionally, the annealing process was necessary to stabilize the filter against further thermally induced wavelength shifts with use in its operating environment. The ability to accurately characterize the spectral performance is critical both as a feedback loop into the annealing processes above and to ensure that final product meets all customer specifications. Measurement uncertainties in AOI, degree of collimation (cone angle) of interrogating beams and analyzing optics, and filter temperature while under test each contribute to the over-design margin needed to guarantee spectral compliance. By minimizing the uncertainties in these aspects of the measurement system it was possible to minimize the over-design needed to “pad” the specs and maximize the over-design margin allowed for variability in the other manufacturing processes (annealing and coating). Lastly to ensure that the spectral characteristics were met over the entire 125 mm clear aperture a custom-built measurement set-up providing x-y spectral mapping of the part with a fully collimated beam path (collimated launch and catch optics) was employed. By employing and optimizing the design and manufacturing techniques described above Iridian successfully produced an environmentally stable narrow (1.72nm FWHM) band-pass filter centered to within ±10pm of the target CWL (~780nm) over a clear aperture of 125 mm in diameter. This filter demonstrates Iridian’s ability to produce state-of-the-art performance large NBPF to a uniformity variation of <0.02%. The above mentioned NBPF has been developed under a contract with Leonardo S.p.a for the Lightning Imager Instrument, in the frame of the ESA program Meteosat Third Generation (MTG), with THALES ALENIA SPACE France as prime contractor.